The new Club Atlético de Madrid Stadium, Wanda Metropolitano, is the result of the expansion of the old Athletics Stadium of the Community of Madrid, completed in 1994. 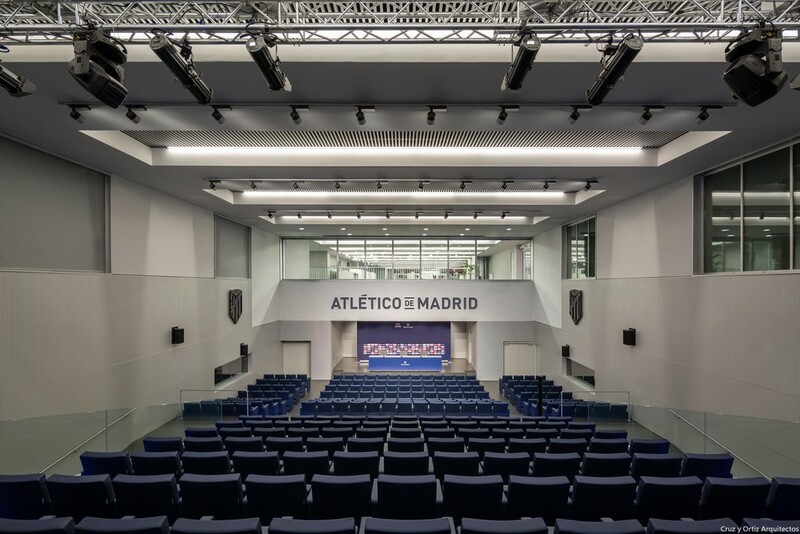 The project consisted of building a football stadium capable of obtaining the highest qualification that allowed it to host European final competitions, and an approximate capacity of 70,000 spectators. 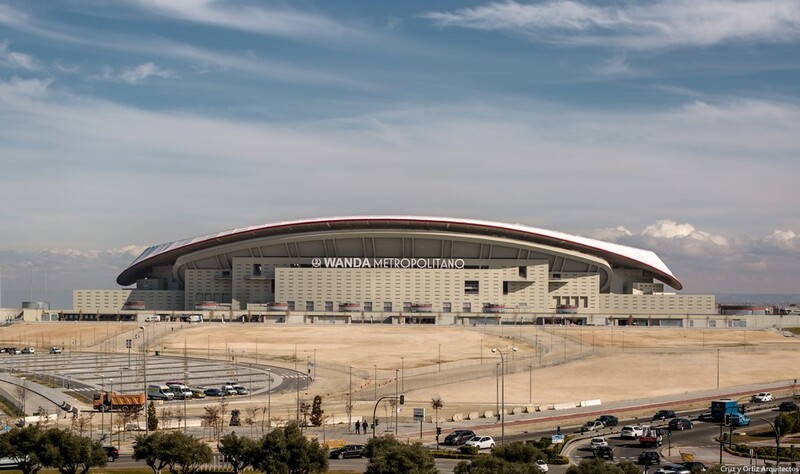 Atlético Madrid’s new Wanda Metropolitano stadium, with a capacity of 68,000 spectators, is the result of the expansion of the old Athletic stadium of the Community of Madrid finished in 1994. The old building had been designed to accommodate athletics competitions and football matches and had an approximate capacity of 19,000 spectators. Initially conceived as the central piece of a group of sporting facilities, the old stadium was created after a competition held in 1988. 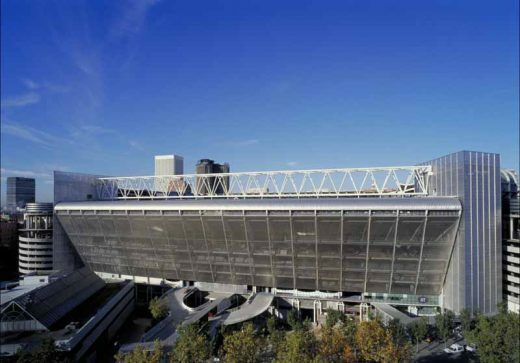 At the time, the building nicknamed the “comb” became a reference point for that whole area of Madrid. 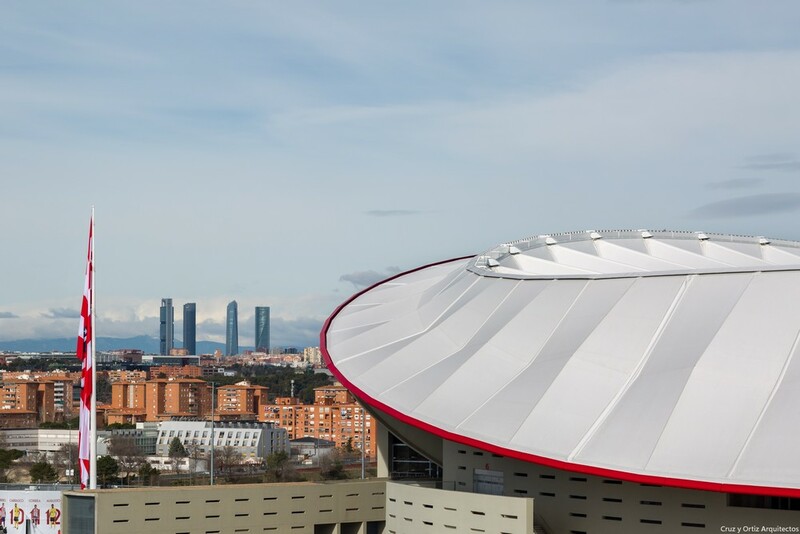 Its clear, round image became a way for the people of Madrid to identify that area with the iconic, distinctive building. 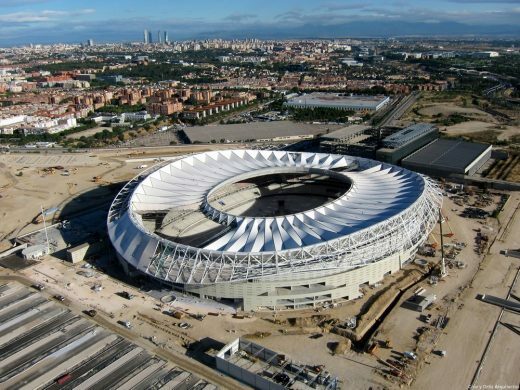 The surface area of the current stadium is 54,537 sqm and the entire grounds are 88,150 sqm. 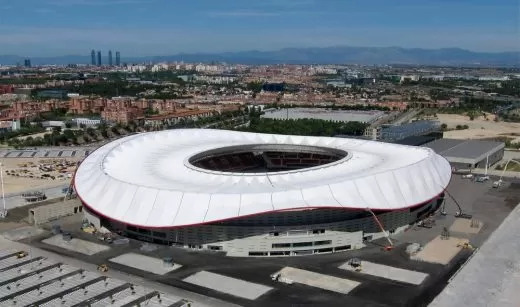 CyO received the commission to extend it to equip it with a capacity of 68,000 spectators and thus turn it into a football stadium with the “5 star stadium” rating awarded by UEFA and, therefore, to be able to host European competition finals. Moreover, FIFA considers those stadiums which have been awarded said rating by UEFA as suitable for hosting final phases of the World Cup, such as the one predicted to take place in Spain in 2018 or 2022. With the new extension, CyO proposed a double design objective: on the one hand, that it didn’t lose that well-known, recognizable image and on the other hand, that the extension formed a harmonious combination with the old design. The intention wasn’t that the new building would be the sum of two different works, but rather a harmonized combination of the two. However, it was also necessary to create an image that could be identified with Atlético Madrid and would possess all the necessary services. Homogeneity, proximity, visibility, comfort, innovation, security and identification with the club. In the design of the new stadium, a priority has been making sure that the spectator has good visibility and proximity to the pitch and the players, whilst complying rigorously with the recommendations of UEFA and FIFA regarding uses. The closest point to the touchline will be situated in the North-Eastern corner where the stands will be barely 5.89 meters from the pitch. The extension also proposed a series of very specific conditions regarding technical requirements like safety in case of evacuation and the requirements necessitated by the show that football matches generate. The concrete, which is responsible for the load-bearing structure of the building and its final form, contributes to the main characteristic of uniformity and homogeneity. The new football pitch was built lowering the height of the original pitch in a way that allowed the spectators to get closer to the playing field without disturbing visibility conditions. The most important uses of the stadium have been placed on the original stand given its symbolic nature, such as the area for players, presidency, VIPs and the press. In the expansion area, as well as predicting the necessary spaces for services for the spectators such as bars, toilets, shops etc., the construction of two underground floors has been planned, the first of which to attend to the needs of the lower stands and parking and the second destined entirely for parking. B. Extension of the Stands. 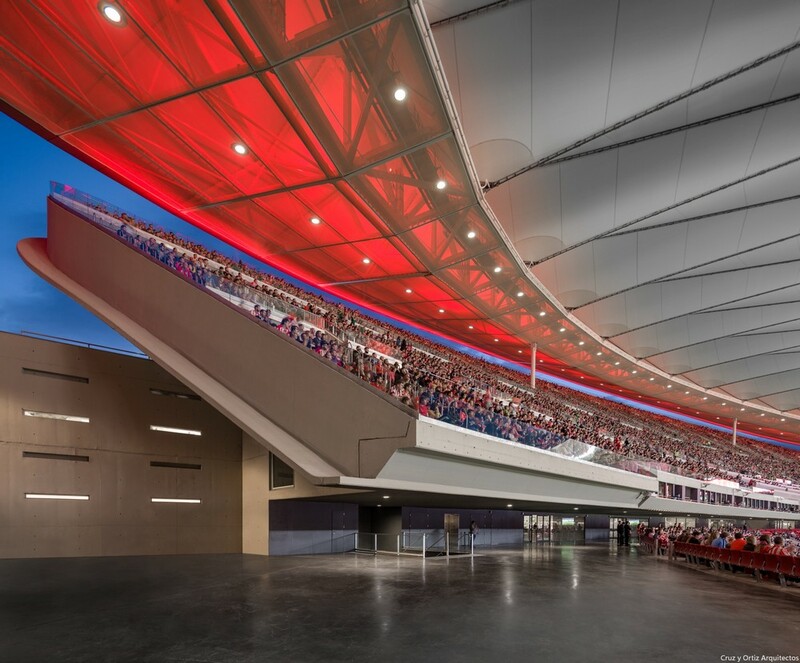 The original stadium, that initially only had a stand on the West side, now has new stands that surround the entire playing field as is normal for football stadiums: the lower stand, the middle stand, a little higher up, and the upper or third stand. Between the second and the third there is a space for the private boxes. CyO opted for the solution in which the stands would not be accessed through corridors but through the higher part of the last row. 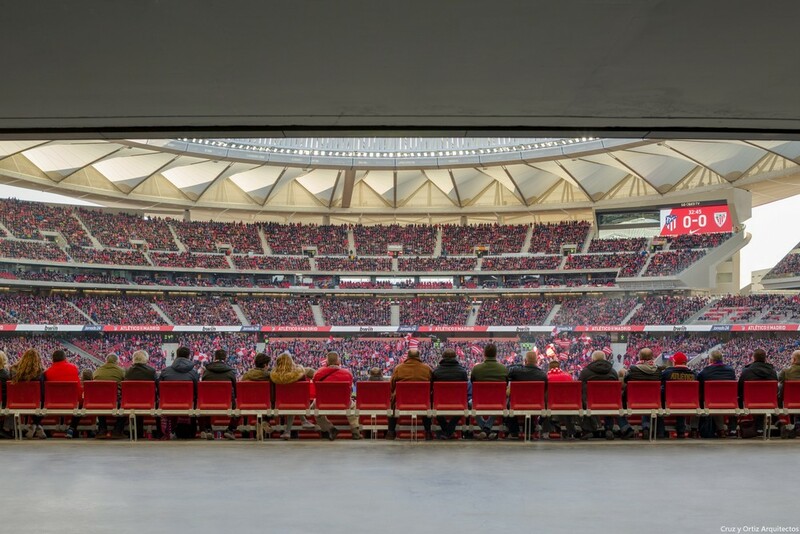 This means that from the waiting areas before going to their seats, the spectators can get a full view of the playing field. In this way, a full image of the stadium, an all-around audience and an audience very close to the playing field has been achieved to try and create a lot of atmosphere during the show. 1. Lower stand composed of 28 stands at the sides and in the areas of preference and the West, with a capacity of 23,000 spectators. 2. Middle stand of 13 stands for VIPs with access from 0.00m height and a capacity of 14,000 spectators. 3. Upper stand supported on a perimeter building of 32 stands, that along with the current stand of the comb give a total capacity of 30,200 spectators, where the public access is located, VIP boxes and complementary services (toilets, bars etc.). A continuous bay has also been built, overhanging the lower part of the upper stand, with 94 boxes with a capacity of approximately 1,500 spectators. 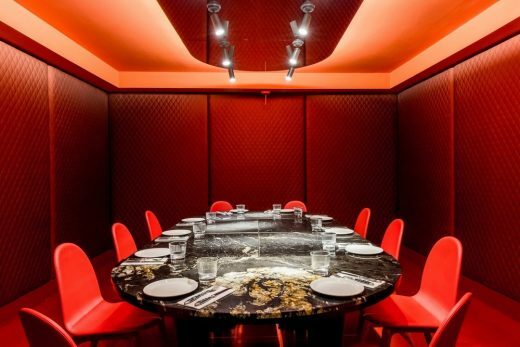 Similarly, booths have been made available for the press located in the current boxes of the Comb for a total of 150 commentators. 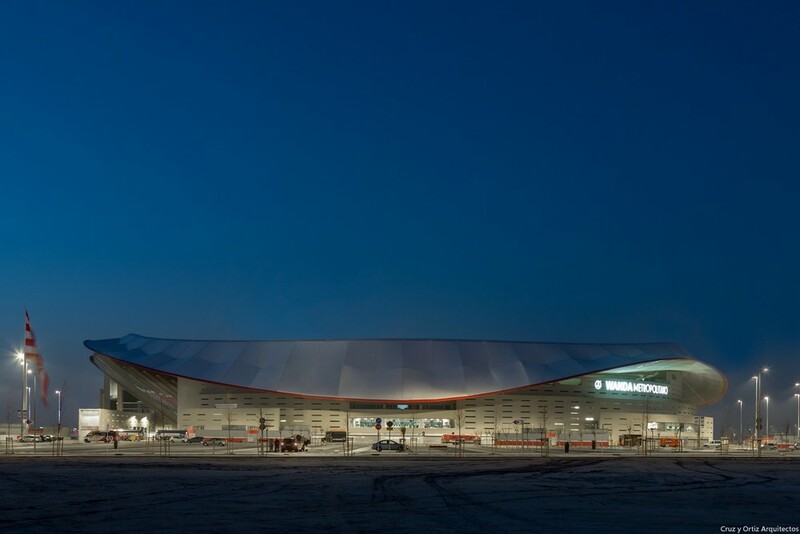 The roof is one of the iconic elements of the new stadium and was carried out in collaboration with the engineer Schlaich Bergermann Partner. For CyO the roof is the formally important element that completes the stadium. 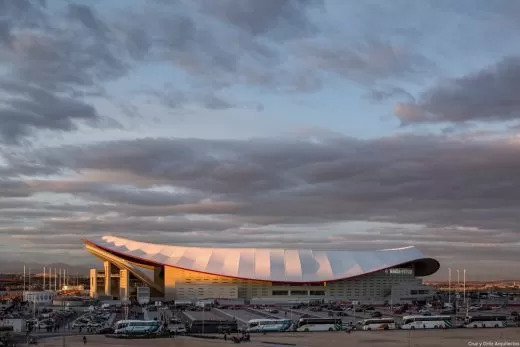 It is a homogenizing element that unites both parts, the first or former part and the expansion and it is necessary to place it over the whole of the new building covering all of the spectators. The roof has approximate dimensions of 286 meters between the north and south ends and 248 meters between the East and West sides. In fact, its total surface area is around 46,500 meters squared. The main structure of the roof is composed of an exterior double compressing ring of steel and an interior double traction ring and two groups of radial cables. The net thus formed is covered using tightened membranes on the warped quadrilateral formed of a high cable and another lower one corresponding to consecutive brackets. The light of the roof (the distance between the compression and traction rings) is approximately 57.00 m. Both rings are doubles, allowing the necessary height of the roof to be divided in two. 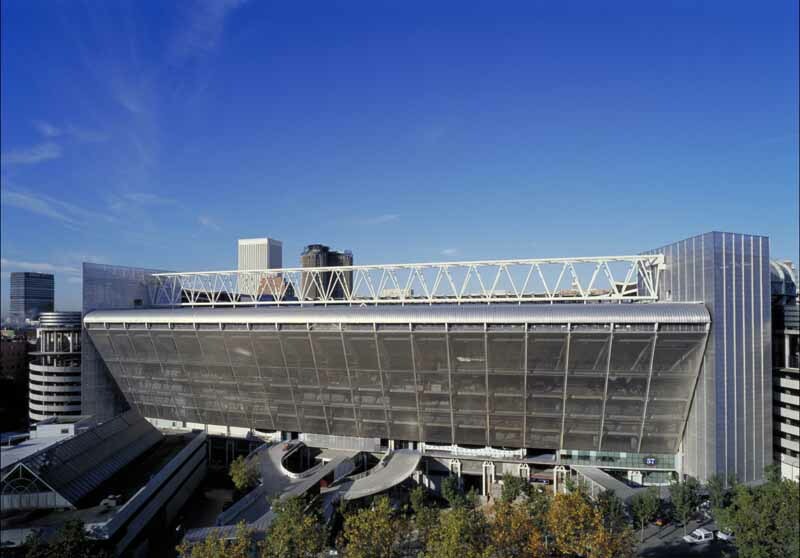 From the compression ring some cantilevers have been produced by tightened membranes that reach the outer perimeter of the old stand and are extended around the whole stadium. 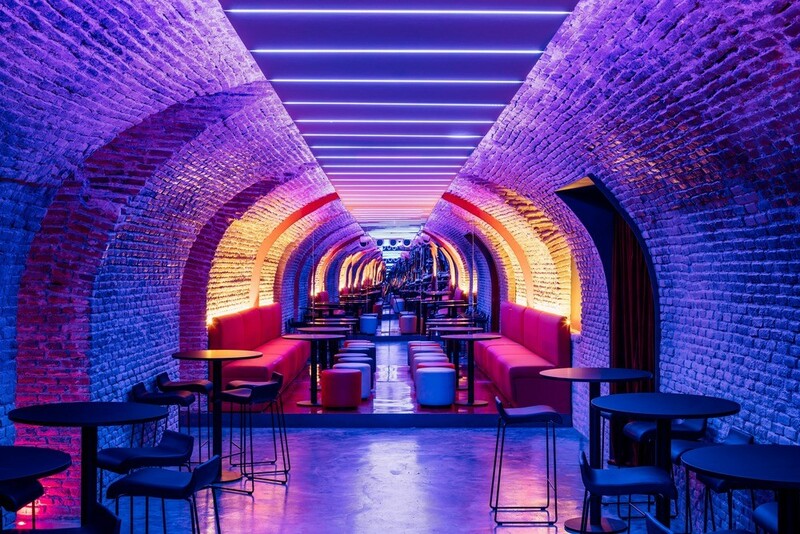 Its wavy shape and variable height generate a certain movement to adapt to the needs of the building. The outer gutter will be red (a colour associated with Atlético Madrid) and the visibility as well as the hiding of this red colour throughout the perimeter will be important in the final definition of the image of the stadium. The result of this process is a light roof that protects 96% of the spectators of the stadium and lies on the stands like a big blanket adapting to different situations and equipping the intervention with unity. Its design is included in the typology of tensile structures. All of this remains covered by membranes of fibre glass and Polytetrafluoroethylene (also called PFTE or Teflon), a translucid material that has been used in other big stadiums like Maracaná or the Olympiastadion Berlin. 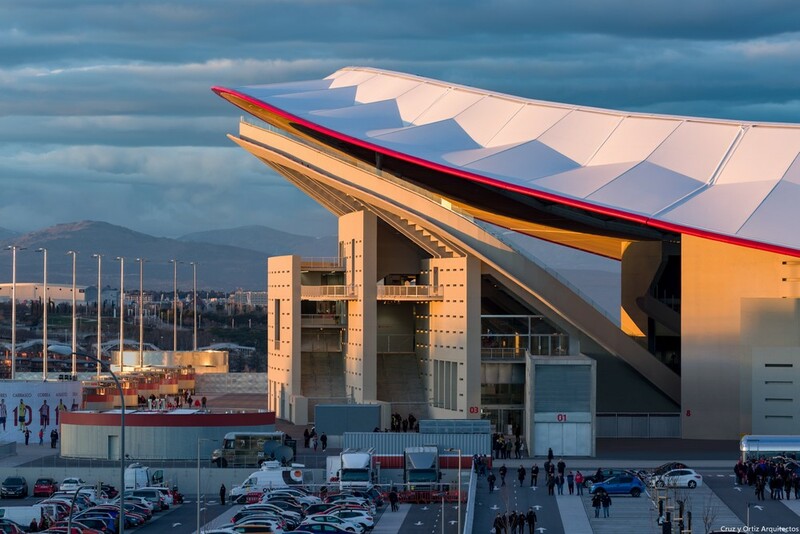 The design of the roof also contributes to making the sound coming from the stands reflect itself in the lower part of the structure, preventing the resonant waves from abandoning the stadium which will make the shouts of excitement from the fans a larger protagonist. In order for more sun to reach the grass, the structure does not cover the playing field. 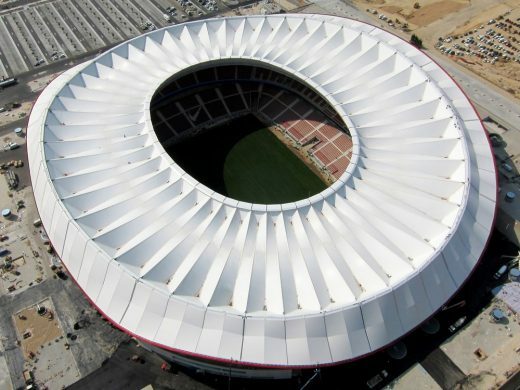 To insure the best possible lighting, the floodlights will be integrated into the interior ring of the roof. 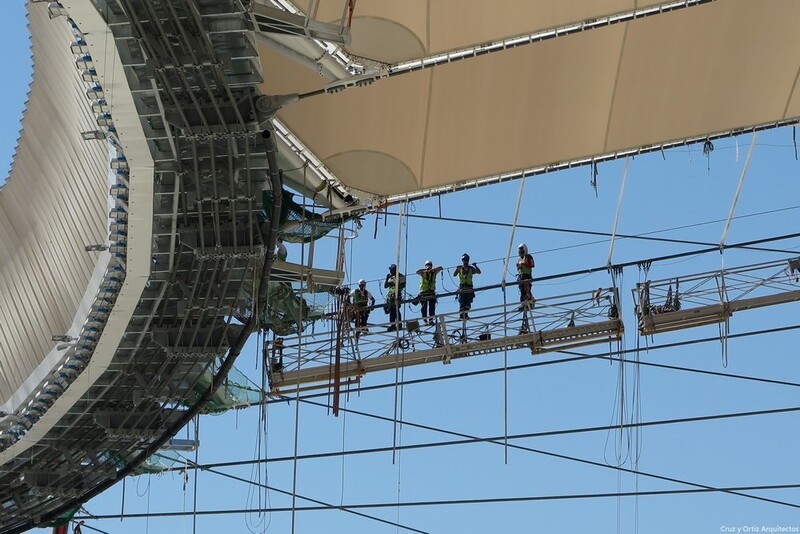 Regarding the level of the field, the roof will have a minimum height of 45 meters and a maximum of 57. 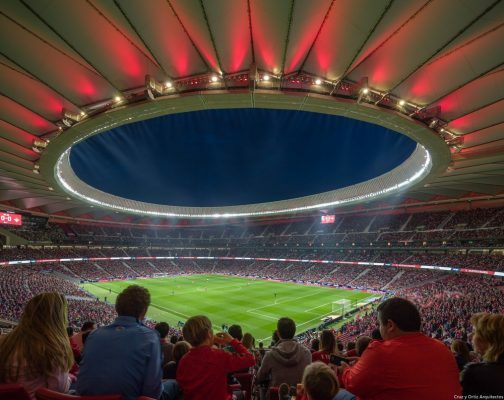 The stadium has a series of camera systems destined to offer the television operators and the spectators a quality broadcast, offering a new way of understanding the broadcasting of matches. 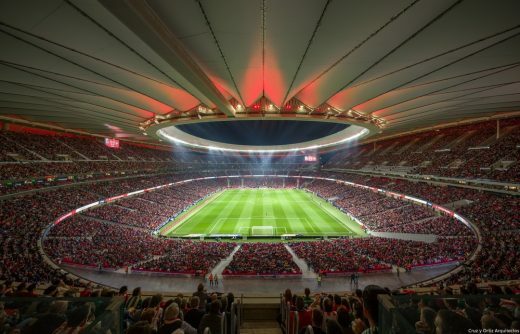 The stadium has 96 preconnected points for the sport broadcasts to meet the needs of the cameras of the different operators who participate in a sporting broadcast. These 96 points are spread out across all the areas of the stadium to be able to give complete coverage, better than normal coverage. This coverage is a lot higher than what UEFA requires clubs who participate in European competitions to provide. Additionally, several camera systems have been installed which are starting to be used in other stadiums, like the Omnisky camera, whose function consists in carrying out television plans on the playing field or the 360º system which serves to carry out a repetition of an action view from all viewpoints. Moreover, the stadium includes other important systems, not related to television broadcasts like the Ghost Goal system, obligatory in European competitions and the tactical and media coach camera systems that have the aim of obtaining technical data from the games.